If it's not a holiday, I'm not enamored of baking complicated-to-make cookies and prefer cookie baking be a smooth, non-intense activity. These cookies are pretty straight forward; the dough is adapted from a stand-by chocolate chip cookie recipe from the Silver Palate Cookbook (Rosso & Lukins). You can decide you want to bake these and get the whole project done in a bit over an hour. Choreography: Mix and bake! No waiting period. 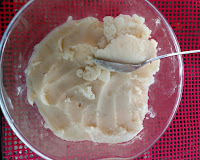 2.Cream margarine (or butter) with both sugars. 5. Pour in chocolate chips, mix until just blended. This recipe is a drop cookie and does not require chilling. 6. Scoop/drop dough (about 1 Tbsp dough per cookie) and drop onto the lined cookie sheet, leaving at least an inch between each piece of dough. I drop 12-14 cookies on one sheet. 7. Bake in heated oven - 11-13 minutes, until the edges begin to brown. Cool for five minutes before moving onto a cooling rack and cool completely. 8. 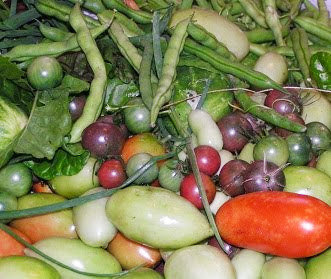 Store loosely covered at room temperature for several days or in a covered container in the refrigerator. 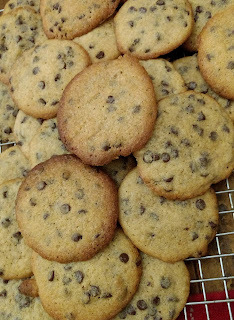 Find other cookies on BreadandBakba.